James J. Caterino : Did you ever know that you’re my hero? I really liked this book. I liked it so much, as soon as I finished it, I started reading it again. It is that good. 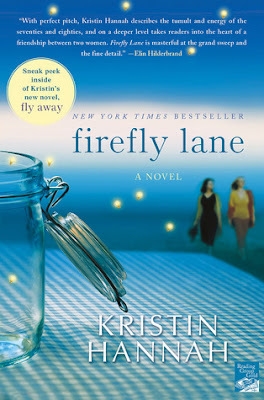 “Firefly Lane” is the epic story of a friendship between two very different girls—Tully and Kate— who meet in early adolescence and become best friends. The connection they form lasts throughout their teenage years and long into adulthood as both women— along with their friendship—become tested in ways neither of them could have ever imagined all those years ago when they first met and became forever bound to each other one magical night at a place called “Firefly Lane”. The opening chapters set during adolescence of Tully and Kate are expertly paced and beautifully rendered. Kristin Hannah writes some of the best adolescent viewpoint material I have ever read. The atmosphere of the Pacific Northwest setting works amazing well and the author provides just the right amount of pop culture references to give us a feel of the time span as the story moves from the 70s to the 80s to the 90s and beyond. But what makes this book special are the two main characters and the unique bond and special friendship they share. Tully and Kate are real people and everything they do and say feels genuine. This is a very easy book to get emotionally involved with. The flaws in “Firefly” are minor. There is an odd (and unnecessary) plot device used that seems to infer the author has something against spotted owls and environmentalists. The secondary characters sometimes come across as flat stereotypes. And the male characters feel like—well—what male characters always feel like in romance books—a far cry from the all so real characters of Tully and Kate. But these are very minor quibbles. This book is about Tully and Kate and the author wisely keeps us there and in the moment from start to finish. Kristin Hannah knows how to tell a story with a laser-like deep focus where every chapter, every scene, every paragraph moves the story forward. The writing is crisp, clean, and always clear. There are even moments—many of them actually—where the book flirts with true greatness and feels like a classic work of literature, not a genre novel read for escapism. This is a book that will draw you in. This is a story that will make you feel. Bottom line: Forget about how this book is categorized. I am not one who actively seeks out what is referred to “Chick-lit”. This is literature—a focused, compelling character based novel with heart. It is about friendship and love and features two wonderfully realized characters that will win you over. This is a book that will take you on an emotional journey—and yes—you may shed a few tears along the way.